The Filion Suites Resort & Spa is a very serene hotel done up in a traditional style. One can find excellent accommodation facilities here. Spread over a 17-acre plot, Filion Suites Resort & Spa is surrounded by olive trees and is close to the Bali village. One can visit the several shops, bars and restaurants in Bali. A very well protected Bay here is excellent for swimming and water sports. Filion Suites & Resort offers a complimentary shuttle service 7 times daily from 9am to 6pm daily to the beach. Two swimming pools along with a paddling section for children provide plenty of entertainment. This is one very luxe resort with very neat and clean rooms and traditionally done elegant interiors. Filion Suites Resort & Spa is quite close to the beach at roughly 1.5km and free shuttles are available. The museum of ancient Eftherna is close by at 12.8 km. The very famous Psiloritis National Park is located at a distance of 19 km from the property. The picturesque town of Rethymo is located at a distance of 30 km from here. 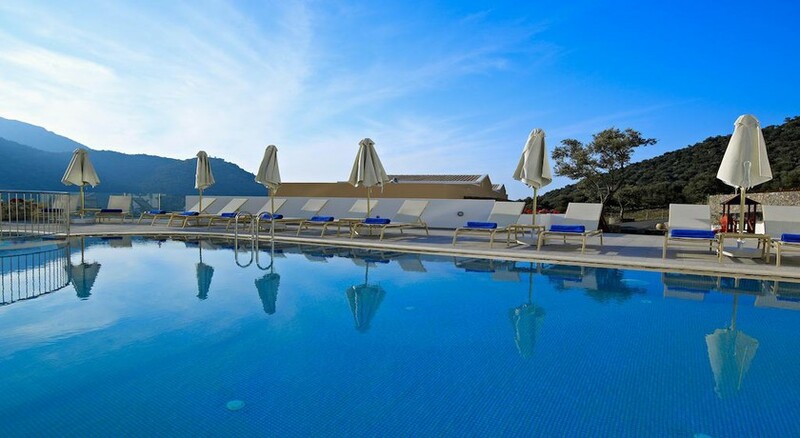 Guests can reach here via air by the Heraklion Airport at 35.8 km and 60.6 km from the Chania Airport. Guests can choose between 50 superior double rooms with large balconies, 27 family suites and 3 Luxury Villas with private pool. The stylishly decorated spacious rooms offer elegant amenities for complete comfort. The rooms are elegantly decorated and air-conditioned. One can find a satellite flat-screen TV and a marble bathroom in each room. The main restaurant of the hotel is a non-smoking area offering Mediterranean and Greek cuisines for breakfast and dinner. There is an open a la carte restaurant serving some light snacks and dishes being cooked right in front of your eyes. A poolside bar serves a wide range of juices, coffee, alcoholic beverages and ice-cream. On the recreation front, Filion Suites Resort & Spa has two outdoor pools along with paddling pool section for kids. One can find parasols, deckchairs and towels here free of charge. Guests can also order snacks at the poolside bar. An indoor heated pool is perfect for swimming in cold weather.